Around a year ago I wrote a post about jellied eels and eel, pie and mash houses in London and I have been meaning to write a sequel on the subject of eel fishing and conservation for a while, as well as looking at some traditional recipes for the slippery fish. The European eel Anguilla anguilla is a threatened species; the IUCN has put it on its Red List as a Critically Endangered animal, yet it is perfectly legal to eat them – and fish for them if you have a licence – the funny thing is adult stocks of eel has remained stable for the last few decades. 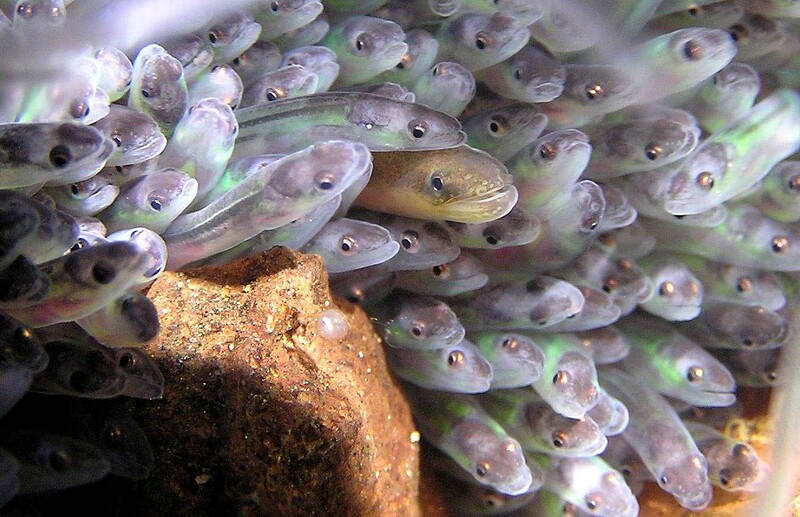 So why has the eel been given this Critically Endangered status? Well it is because the young eels – known as elvers in Britain, but more commonly known as glass eels – have had the drastic drop in population. Some of these populations have crashed by 95% in some areas. The paradox is: how can the adult population be stable whilst the young have diminished in number so much? Well the short answer is that we don’t know! Elvers resupply our rivers of stock eels after a long migration from the Sargasso Sea where they were born. Understandably, this part of the life cycle is poorly understood, and all scientists and conservationists can do is count the number reaching our estuaries and rivers and monitor them carefully. In the month of April; the shores of the Severn are annually darkened with innumerable quantities of elvers, which are seen fringing the sides of the river a black ascending line, which appears in constant motion…When the elvers appear in the river they are taken in great quantities with sieves of hair cloth, or even with a common basket, and after being scoured and are offered for sale. They are either fried in cakes, or stewed, and are accounted very delicious. The UK ‘elvering’ season is from February to May with its peak in April and it is legal to fish for them if you have the appropriate license; and it can be big business when they sell for £200 a kilo. They go for these huge prices because they are snapped up by the Chinese in order to restock their fisheries. Elver fishermen have an obligation to fulfill if they want to go fishing for glass eels – 35% of their catch must be relocated upstream. 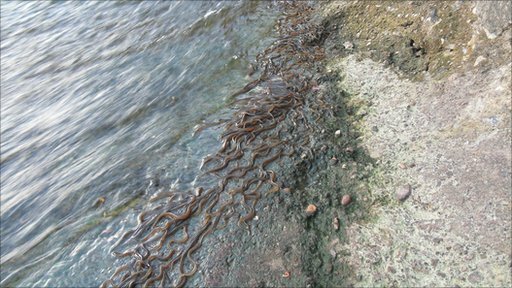 Tiny elvers entering estuaries are often impeded from reaching rivers because of flood barriers. By physically moving them upstream they can do as nature intended and live their lives in British freshwater before slipping back to the Sargasso to breed. This seems to be working – numbers of elvers in the River Severn are on the up, though this could just be population fluctuation. So what do we conclude here? Well jellied eels are not to be consigned to the history books – with careful monitoring there should be well-stocked eel fisheries. It’s simple: only buy farmed eels, not wild, and on no account never buy elvers. Exports outside the EU are rightly illegal and this measure along with restoring habitat and unlocking migratory pathways are important conservation measures. 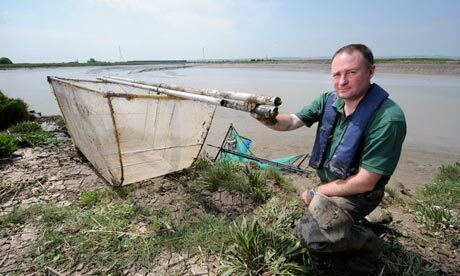 on the severn last year 10 million were caught in handnets and 75% were used for restocking . do call if you need to know more07887993924. Thanks very much for your comment Andrew. I know the measures taken to get number up AND into the rivers is no mean feat. My firat scientific publication was on the subject of elver sampling so I have always had a soft spot for them. Seriously – I’m so glad that you read and like my posts. An award like this spurns you on to get better and better at writing, so to know that people read it and think of it is very flattering. You are very welcome and yes I love reading your posts! I agree getting this type of attention can motivate you. Haven’t been on your site for awhile! Nice to see you again :). 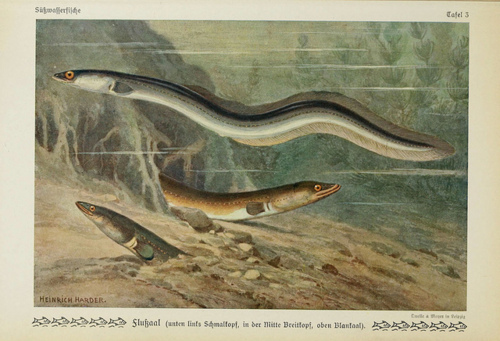 Eels have never appealed much – guess I can’t make out whether they are are more fish than snake or vice versa… I have always passed them up when they are encountere on a menu. Do you like them? Just don’t try jellied eels. NOT for faint-hearted! I love eels! Im actually going eeling tonight with a friend. I normally catch 4 or 5 and them smoke them the next day! I am very jealous, William, of both your eels and your smoker! I’d love to go eeling. Do you need a fishing license? What do you use as traps?